as well as the corresponding c2r routines with the input/output types swapped. These routines work similarly to their complex analogues, except for the fact that here the complex output array is cut roughly in half and the real array requires padding for in-place transforms (as in 1d, above). As before, n is the logical size of the array, and the consequences of this on the the format of the complex arrays deserve careful attention. Suppose that the real data has dimensions n0 × n1 × n2 × … × nd-1 (in row-major order). Then, after an r2c transform, the output is an n0 × n1 × n2 × … × (nd-1/2 + 1) array of fftw_complex values in row-major order, corresponding to slightly over half of the output of the corresponding complex DFT. (The division is rounded down.) The ordering of the data is otherwise exactly the same as in the complex-DFT case. For out-of-place transforms, this is the end of the story: the real data is stored as a row-major array of size n0 × n1 × n2 × … × nd-1 and the complex data is stored as a row-major array of size n0 × n1 × n2 × … × (nd-1/2 + 1) . For in-place transforms, however, extra padding of the real-data array is necessary because the complex array is larger than the real array, and the two arrays share the same memory locations. Thus, for in-place transforms, the final dimension of the real-data array must be padded with extra values to accommodate the size of the complex data—two values if the last dimension is even and one if it is odd. That is, the last dimension of the real data must physically contain 2 * (nd-1/2+1) double values (exactly enough to hold the complex data). This physical array size does not, however, change the logical array size—only nd-1 values are actually stored in the last dimension, and nd-1 is the last dimension passed to the plan-creation routine. For example, consider the transform of a two-dimensional real array of size n0 by n1. 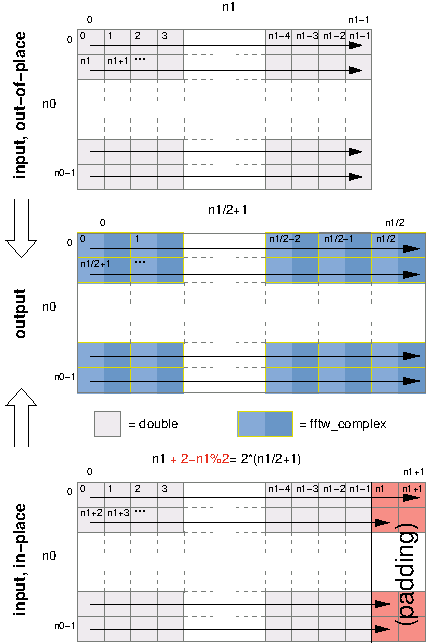 The output of the r2c transform is a two-dimensional complex array of size n0 by n1/2+1, where the y dimension has been cut nearly in half because of redundancies in the output. Because fftw_complex is twice the size of double, the output array is slightly bigger than the input array. Thus, if we want to compute the transform in place, we must pad the input array so that it is of size n0 by 2*(n1/2+1). If n1 is even, then there are two padding elements at the end of each row (which need not be initialized, as they are only used for output). These transforms are unnormalized, so an r2c followed by a c2r transform (or vice versa) will result in the original data scaled by the number of real data elements—that is, the product of the (logical) dimensions of the real data.